from landfills for their products. One (fire)man's trash is another man's treasure. Ingeniously stitched from decommissioned fire hoses, Elvis & Kresse's line of rugged bags, belts and more embody the essence of sustainable style. Donated by fire brigades across the UK, the hoses—some of which have seen up to thirty years of service—are given a proper scrubbing before they're transformed into a range of handsome accessories that can stand up to any traveler's constant abuse. 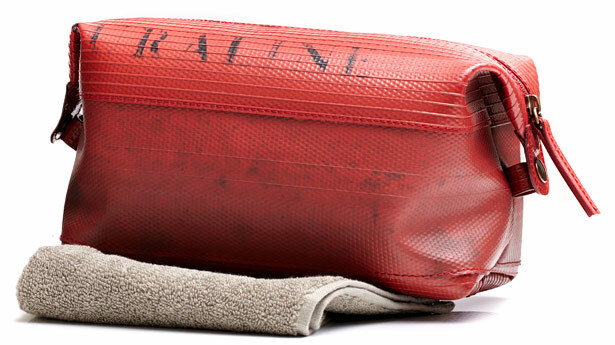 We're big fans of their virtually indestructible, waterproof wash bags, lined in reclaimed, military-grade parachute silk and perfectly sized to fit all of your travel essentials. Plus, fifty percent of the label's profit goes back to The Fire Fighters Charity.